Nicotine salt bases are here! Nic salts are a relatively new product that is quickly becoming a hit with the vaper community. Instead of using traditional liquid nicotine solutions (known as “freebase” nicotine) many e-juice manufacturers prefer to buy nicotine salt bases because of the smoother, more appealing sensation they provide. The vaper experiences their nicotine fix much faster and more similar to a traditional cigarette hit, than through vaping conventional e-liquids. It’s the ability to vape more nicotine per puff that makes nic salts so very appealing. Chemnovatic offers highest quality nicotine salt bases (also known as unflavored nicsalt eliquids) to eliquid manufacturers at great prices and in a range of concentrations. Usually, beginner vapers complain that vaping does not provide the same nicotine hit as a traditional cigarette. This very often results in going back to smoking. Nicotine salt e-liquid provides a smoother, more delicate nicotine hit than recipes containing higher nicotine concentrations. 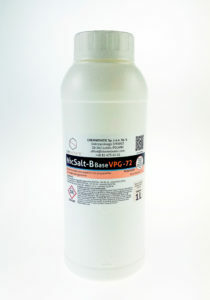 Just like conventional pure nicotine liquid, nic salt bases are flavourless. 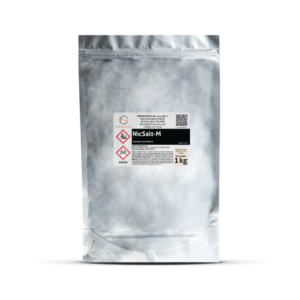 NicSalt nicotine salts are manufactured from naturally extracted pure nicotine and are considered much more stable than traditional, freebase solutions. Therefore, nicotine salt bases are often reckoned much easier to inhale than regular vape juices due to lower volatility and increased bioavailability. The throat hit is less harsh, which means that DIY’ers and e-liquid manufacturers can boost the nicotine concentrations of their favorite recipes without negatively affecting the throat hit. Nicotine salts bases are ideal for manufacturing vape juices for MTL devices, pods and low power ecigarettes. If you are a beginner, pod user, or simply want to lower your e-juice use – try NicSalt bases!